For pastoral care, spiritual guidance, or and/or a listening ear contact LifeSpring Church. You can come to us or we will arrange a time to come to you. If you have been displaced from your home due to the flood, you are likely in disbelief and experiencing a variety of emotions. There are people from a number of local churches available at Bellevue Christian Center Distribution site (1400 Harvell Drive) and Thanksgiving Church (Corner of Hwy 370 and 36th Street) prepared to listen and pray with you. If mental health assistance is desired, we can also connect you with those resources. 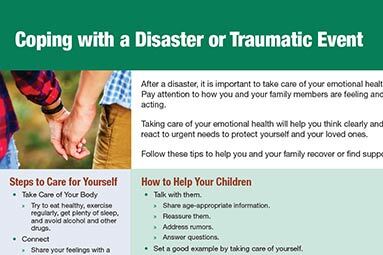 Below is an article from the CDC about coping with the emotional stress after a natural disaster. People with preexisting mental health conditions should continue with their treatment plans during an emergency and monitor for any new symptoms. Additional information can be found at the Substance Abuse and Mental Health Services Administration website.